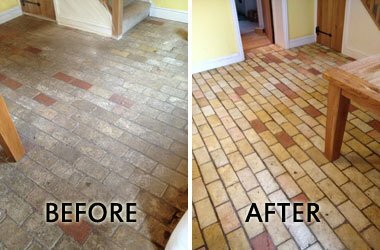 Are your floors beginning to look tired? A little less than perfect? It’s no secret that floorboards and other flooring surfaces will deteriorate rapidly over time, and especially when they’re not receiving the proper care and protection. Well, fear not – we’ve got the perfect solution for you, with our experienced service for hard floor cleaning in San Bruno. We’ll be able to deliver superb results on your hard and soft wood floors, parquet, laminate, tiles, slate and stone. We can offer cleaning services, repairs and maintenance, as well as full protection treatments for your floors in San Bruno. So get in touch with us today… and get your free, no-obligation quote on our affordable services! We equip all of our staff with state-of-the-art cleaning gear, in addition to thorough training and plenty of on-the-job experience. We make sure that all of our staff are thoroughly background checked, as well as coming to you with extensive public liability insurance. We’re happy to be able to offer our services at some of the most competitive rates around. Call us for your free quote today! We provide a 24-hour contact line, allowing you to reach us for support or quotes at any time you need to. How did we do? If there was anything you felt we missed from the service, then the second visit will be free. Hand-picking the most skilled and experienced local professionals to join our floor polishing team means you always get the most effective service. Every specialist we hire has been carefully checked and works under full insurance cover for your peace of mind. On top of this, we twin our stringent hiring process with a commitment to always using the most effective tools on the market. In the case of our precision floor cleaning services, this means high speed rotary equipment. Contact us on (650) 835-4447 for a free, no-obligation quote on the service you need. We're on the line 24 hours a day, every day of the week, and you can also reach us online! So, why not enter your information into our booking form or chat facility to get the ball rolling right away?